Fasten your seat-belts. Prepare for takeoff. At last we get to... the Genius. My favorite thinker of the "modern" age, almost a prophet among philosophers. He parted the waters of thought like Moses, and every philosopher in his wake struggled to understand his message, to try to somehow follow in his enormous footsteps. They all fought to become his heir, to "complete" his system as if he had formulated a new set of physics. Of all the people in the book, he is the only one that I felt was a true kindred spirit. 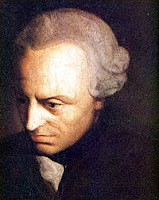 "My enormous brain can't fit in this tiny skull"
Immanuel Kant (1724-1804) was born in the capital of Prussia and was a promising student, dabbling in science and coming up revelations about how the solar system was formed. But he is most famous for what he accomplished fairly late in life: the legendary "3 Critiques." The first book, the Critique of Pure Reason, is considered by many to be the greatest philosophical work of all time. 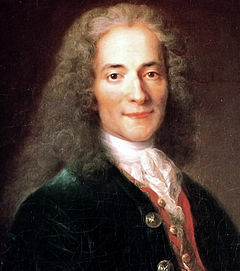 In it, he defines the spheres of knowledge and explains what philosophy can do and what it cannot. The 2nd, the Critique of Practical Reason, is of more interest to someone like myself, who cares less about idealized rules and more about how to actually live in the real world. But to me, the 3rd volume, the Critique of Judgement, is his true masterpiece. Bang! Um ... who shot the gun? Hume claimed that all of knowledge would eventually be answered by science. But Kant recognized something that is becoming ever more obvious today. Science has a limit. 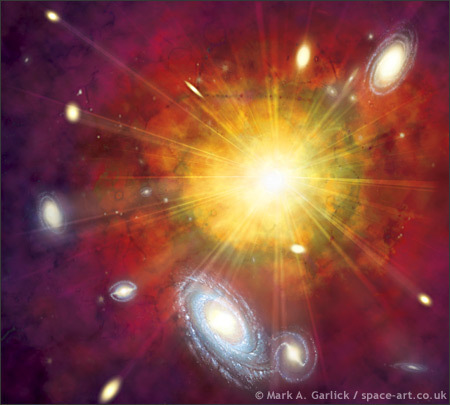 For instance, even presuming that the Big Bang spawned the universe and was the beginning of time, what came before that? I believe our finite minds will never know. And on the other end of infinity, we used to think that "atoms" were the smallest, indivisible particle of matter. Then we discovered protons and neutrons, which themselves are composed of infinitesimally small things called quarks. 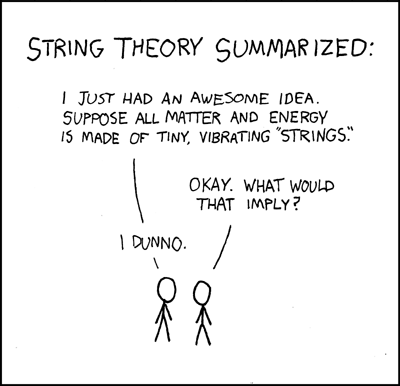 And these mysterious quarks themselves may be composed of multidimensional vibrating "strings", so tiny as to be beyond comprehension, and which could exist simultaneously in parallel universes. Someday we may discover the mysteries of the creation. But I believe the search will go on forever. (And isn't that a great thing?! Thousands of years from now, if our species doesn't destroy itself, we will still have the joy of discovering new and exciting things.) After all our brains are essentially the same as chimps with some extra processing stitched on the front. The universe is infinite in both the Big and the Small, it is timeless, fantastically grand. Our lives, our species' entire existence is only a speck. So Kant said we must separate the world into two spheres: that of the knowable, which would be governed by its champion: science; and that of the unknowable, which would be governed by reason. Note that Kant the Christian didn't anoint God the champion of the other realm. Instead, he used reason to postulate God's existence, which to be honest I find refreshing. But this is just the start of Kant's extensive writings.